Being able to hire battery for odd long trip would be bonus. The alternative is pub lunch and top up, £850 buys a lot lunches. Before I got my extender I used to borrow a 500wh battery from a local hire place for €5 a day . They wanted to charge me less but I just gave them 5, when I first asked I was expecting more than that. 710 miles reached and only one irritating niggle in the form of a creek from I,m not sure where when pressing on pedals, more so on the left pedal than right. This has been happening over last 250 miles or so and has disappeared at times before reappearing later. Have changed the pedals but creeking still there, have checked tightness of various allen screws being careful not to overtighten, greased seat post and checked saddle tightness etc, all to no avail. It seems the times when the noise has disappeared is when riding in the wet or on muddy trails so have paid extra attention to the drive train, making sure cassette and chain is completely clean and lubricated each chain link roller. Have given it a run out this evening and it seems to have almost cured it, just heard it a couple of times when pressing hard on the pedals but is loads better. Hopefully the problem is now identified and either more frequent lubes and/or a new chain will stop it happening again. I have it booked in for a service at 50 Cycles in about 10 days time so think I'll get one fitted then. Apart from that the Haibike is performing well, is a joy to ride. I like the styling and liveliness of the frame, it copes well with light off road use and is solid on the road with no detectable flexing on fast downhills even when loaded up. There are some great ebikes available nowadays but I reckon the Haibike Trekking is good value for money with either Yamaha or Bosch units. Undoubtedly bikes such as R and M are nicely engineered with a lot more quality features with suspension, hub gearing, dual batteries etc and would be more capable probably over more extreme and exposed terrain of far flung corners of the world, but they are also around twice the price of the Haibike Trekking. Don't get me wrong, I still read the R and M reviews and in my mind they are real quality and worth the dosh; one day maybe in the not too distant future I will succumb although not sure exactly which model yet. And I've still not really got my head round the Yamaha / Bosch debate, having only ridden but not owned a Bosch powered bike I haven't yet realised the Bosch supporters claims of superiority. I have been well satisfied with the two bikes I've owned fitted with the Yamaha PW unit with their response, low noise and of course, reliability. I understand that the Bosch may deliver it's torque at lower revs than the PW and therefore may be better for both touring and also MTB in the Performance CX form, but some may prefer to keep the revs slightly higher at around 65 to 70 rpm which I understand is the most efficient for power delivery from the Yamaha unit. Now there's a lot more knowledgeable people out there that have more experience of both these motors and others that will be able to offer more info on this subject I,m sure. Seems to me though that after the first 700 miles the SduroTrekking has proved itself as a very capable all rounder and I can really recommend it up to now. I've been riding 'quality' bikes now for around 40 years and there have been many of those bikes that have coaxed me away from the comfort of the sofa for a hour or so for a ride out during a cold night, purely for the joy of riding the bike. The Haibike Trekking is one of those bikes. 1000 mile marker reached yesterday without any problems apart from a noisy chain at around the 700 mile mark which was cured by cleaning it carefully. The SduroTrekking Yamaha unit continues to perform faultlessly and many friends who have tried the bike remark on its lively performance. It seems lighter than other ebikes although specs show little difference, maybe it's down to the frame design as it seems well balanced and a very capable machine. Continues to be a joy to ride, very reliable and looks good. Up to now have mainly used it with a rack top bag but now the dark nights and lower temperatures are here will use Ortlieb panniers more often, to carry bigger jacket and more reflective gear etc. Either way the Haibike rides well and " does what it says on the tin" as the saying goes. I haven't much experience of Bosch motors, and I don't doubt the enthusiastic reports from Bosch owners of how capable they are, but I cannot fault the Yamaha PW motor with its smooth running and responsive power delivery. The issue of torque delivery dwindling at the higher rev range doesn't bother me at all, although maybe if I was more of a high revving mountain biker I could realise the advantage of the latest Bosch's broader torque band and the ability to tweak the settings to do this. The SduroTrekking is basically a touring road bike that has light off road capabilities so the PW unit is more than suitable for the job in hand. Without having a go at a certain other well known ebike brand, I,m really pleased with the Haibike,s reliability so far and feel able to recommend it as a reply good buy. Value for money? Well I really think that ebike prices generally may ' relatively' decrease as they are obviously becoming more popular. 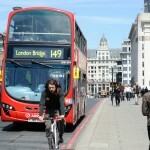 For many, the thought of spending £2k+ on a commuter bike can seem bonkers until they do the maths and compare it to public transport costs per annum. For others the purchase cost is ok maybe because the old saying " you get what you pay for" mostly rings true, and possibly more so with ebikes due to electrics and software equipment etc. Haibike and particularly the Trekking model seems good value for money in my mind. Now the first thousand miles have passed I think I,ll start to make changes to the bike starting with chopping down the handlebar width and fitting bar ends. The handlebar width makes it more tricky to negotiate cycle path entrances / gateways, so maybe an inch or so off each end will suffice. Maybe a nice new Brooks B67 sprung saddle might be a good investment in time to counteract the lack of rear suspension and add to overall comfort. 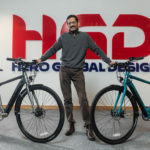 Overall though, the Haibike has turned out to be a really good choice and although there are many other good options it will take a lot of deliberation before I consider a change. The other option is to own more than one maybe! Haven't posted lately and have done around 1350 miles on the Haibike Trekking. Have tried to think of reasons to swap for a Riesse and Muller, maybe a Delite, but can't justify this at the moment due to genuinely enjoying the Haibike every time I ride it, even if it's only nipping across town. I have a sprung Brooks B67 fitted since start of the year, which has transformed the riding experience bringing outstanding comfort and suits the bike perfectly. More recently I've been using the Standard setting which the second highest, and after rides of around 30 miles still have 50% of battery remaining. On Eco setting there is around 70 to 80 miles available when riding carefully. Very rarely use the lowest Eco+ setting as it's much less pleasurable. Not sure yet if I will buy a spare 500 Watt/hr battery to more or less guarrentee 100 miles capability. £850 is a lot of dosh for a battery and as other forum members have pointed out, that money can buy a lot of lunch stops while recharging. Over an hour, the battery can be topped up quite significantly, but it does take nearer 2 hours to achieve a 50% charge. R and M e bikes are beautifully made machines, there is no doubt, and maybe I might succumb and make a purchase in the future, but I'm keen to pile a good amount of miles on to the Haibike at the moment. However my wife is interested in testing a R and M Tinker HS, and will do this in the next couple of weeks. She is considering whether she might find the compact frame more manageable and likes the idea of the extra power of the HS motor. Also the Tinker would require less storage space than her present Giant e bike. If anyone has any experience of the Tinker would welcome any comments. Another possible choice would be the Haibike Radius Tour, which although is not HS, is significantly cheaper, and uses the same battery has my Haibike I think, and I maybe able to borrow it if planning a longer tour. Trouble is I'm not sure who has one in stock so,s we can take a look at one, will enquire with my local 50 cycles to see if they have one or can get one. Again would welcome any thoughts on this. Being able to swap batteries is big plus, one reasons for wife's new ebike. Your range is limited by combined capacity not single battery. I typically use 1/3 less than her. My AVE MH7 is a 20" wheel compact framed Bosch ebike - very similar to the Tinker. I rate it highly, the smaller frame and wheels do make for a much handier package. Comfort might not be quite as good as a big wheel bike, but I've still done - and enjoyed - many 50+mile rides on the AVE, my record being 86 miles. 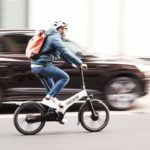 The Orbea Katu ebike version is another to consider, it comes in Bosch or hub motor flavours. You won't go wrong with an R&M bike, but they are only marginally better made than other premium brands. Bike style to suit is more important. I bought my Charger because I wanted twin batteries and a Rohloff hub - R&M was the only game in town. The Delite you fancy is also unique, being the only ebike with full suspension tuned for road/cycle path riding, and the bike itself being trekking spec - mudguards, carrier, lights, etc. Thanks for replies guys, paid a visit to 50 Cycles today and Jennyg road tested the Tinker HS with me on a Nevo HS. We covered some undulating roads and a short distance on rough track. The top and bottom of it is she felt much safer and more in control of the Tinker's compact frame and loved the extra power from the 350watt motor. The benefits of being able to move the handlebars sideways and downwards enabling it to take up less storage room swung it and a purchase was made, and we plan to pick the Tinker up tomorrow. Jennyg is very excited and looking forward to leaving me behind when my Haibike motor cuts out the assist at 16mph! Yes it's a big outlay but hopefully over time the quality of R and M will show through and give lots of pleasurable miles. Thanks again to 50 Cycle at Loughborough, and to Mike,s patient assistance in helping us choose the most suitable bike for our needs. What did you think of Nevo?. Actually thought it was a nice bike, it has a step through frame which is obviously easy to get on and off. It was fitted with the Nuvinci hub which is great once I got used to it and is very much suited to e power. Step through design is traditionally for females in the UK, but for those of either gender who are not too agile or have hip problems maybe, the frame design would be a godsend. I was passed by Mrs G on her Tinker like I was standing still this evening! Still love my Haibike but have thinking cap on for a future change; there's a lot to be said for a compact frame design. The 2000 mile marker came up today after after 14 months of ownership, not once has this bike given any hint of any trouble at all when covering road and rough tracks. The Yamaha PW system in my eyes is great, quiet and reliable with loads of torque. The battery still charges up too 100% and range from the 500 watt hours is dependably around 70 miles using a variety of mode levels and differing terrain. Today I kept it mainly on the lowest assist mode (eco+) using the eco and standard modes for only around a mile or so. After 29.1 miles the battery had 75% of its charge remaining, which at that rate would have realised about 116 miles using the complete charge. Eco+ mode is not very inspiring at all and very much like riding a heavily laden unassisted bike at a typicaly slowish touring pace, and I don't tend to use that mode much at all. The eco and standard modes are much better and good distances can be achieved without expelling too much energy, I very rarely need the highest mode, it's reserved for really rigorous or extreme hills and I haven't found many that can't be adequately handled in the standard mode. Yes they're are limitations in power delivery when the rpm raises to around the 75 to 80 mark, but changing to a higher gear quickly solves that problem. However, I would be interested in trying the Pwx motor in the future to compare the differences. Comparisons between the Yamaha and other leading motor brands should be covered in a different thread, but the PW in my mind takes some beating when mounted in a hybrid, ' do it all ' type of bike. 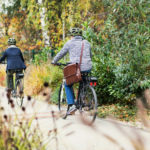 In short, the Trekking is a very capable, stylish and reliable ebike, carries heavy loads well, and may be thought of as being good value for money if it's reliability continues as the miles increase. Funny, but I tested one of these today and was really impressed with the build quality. However, that is a massive cost for a new battery! How long will the original last before it needs replacing? Putting me off a bit. my 2014 bosch batt is still going but it has lost about 25% of its range and as i use a dongle and mostly turbo im happy with that. Now that makes more sense! Looking at a Cube Touring Hybrid 400 or this one. Not peddled the Cube, but it also has some good reviews. Not sure what you mean by a dongle. Also, I can get a great deal on either a 48cm or 56cm frame men’s bike, but I am 5”8, would the 48 be too small & 56 too big? Dongles are devices that you can fit to certain ebikes that fool the computer into providing power beyond the 15mph standard cut off limit. They are worth their weight in gold for me.